A 10mm lens with 10mm focal length has the same f number as a 1000mm lens with 1000mm focal length, however the 1000mm lens will throw further because the delta of incidence angles is smaller. 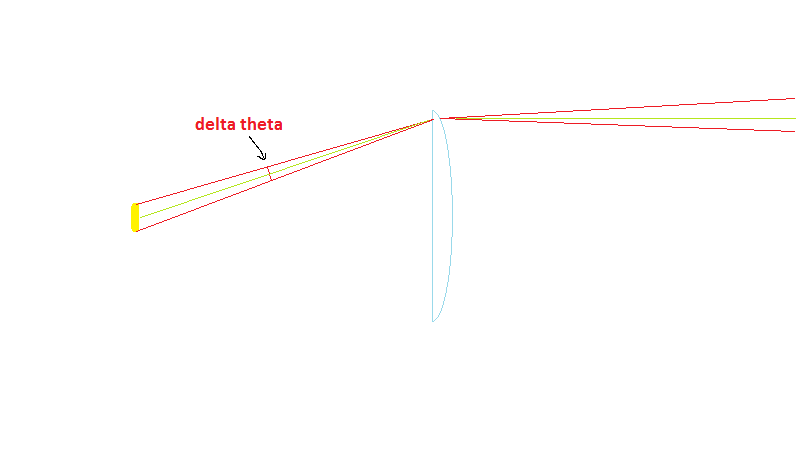 I think you guys are forgetting that an LED is not a point source of light, and therefore it is also important to have the optic as far away as possible from the LED (in order to minimize the delta). @sedstar Not me. I just want to check the accuracy of claimed focal length and show for a given lens size the effect of focal length (and related f number) on the beam projected. As a former calibration tech (metrology) quantifiable data and related testing have a special significance for me. If you know the significance of the 4:1 ratio in metrology you get a cookie. The relationship between lens diameter and focal length are in a way (to me anyway) similar to resistance and capacitance in an rc circuit. FWIW, the first stage of my plan is to use a set diameter lens and a range of focal lengths with the same emitter. The second stage is to use a set focal length and a variety of diameters with the same emitter. Third stage is lenses with the same (or as close as possible ‘f number’. To minimize cost the head tubes will be rolled aluminum flashing sprayed flat black inside. I’m not wealthy so it will take a while to accumulate lenses to illustrate the relationship between lens diameter and focal length and the resulting beam. You can also download a free ray tracing tool like http://arachnoid.com/OpticalRayTracer/ to get a pretty accurate guess as to how the lenses will perform. That’s assuming the lenses are sold with accurate characteristics in the description. Often these lenses are offered via sites that also offer 5000 mAh 18650s and 30k lumen latticebright powered flashlights. Establishing a baseline for comparison with real dimensions and values should be useful. That’s assuming the lenses are sold with accurate characteristics in the description. Often these lenses are offered via sites that also offer 5000 mAh 18650s and 30k lumen latticebright powered flashlights. Establishing a baseline for comparison with dimensions and results should be useful. The diameter and thickness are pretty accurate, that’s all you need to know to replicate a lens similar in the software. Playing around with the diameters and focal lengths and stuff you can see why it is better to have larger diameter and longer focal length. The ray tracer emits all rays from a single point though, so to see the irl divergence you need to place the origin of the rays about 1mm below the x axis (depending on the led) and look at how much divergence the rays have. The farther the optic is from the LED, the less the rays diverge. try to appreciate, i spent most of my life relatively uninterested in photography, beyond if i needed to take apicture? i wanted a camera. i was always fascinated by japanese tourist cameras, as we called them in the old analog days… but, as a mechanical curiosity to me only. if you had one? i wanted to touch it, i wanted to play with the focus and be allowed to snap a pic. i was always at these times, curious of what “the weird controls were”. its unexplainable to a complete camera noob. they would set the shutter and iris control? i was allowed to “play the focus” and snap my few pics. then came the night vision projects? LMAO. i had to jump INTO this, and unfortunately? i suddenly hada burning NEED to understand as much as i could about the math of optics, if i was to design something, to uncover something. i had to “grok” the entire system in as much mathematical model as i was able to. to be into night vision though? 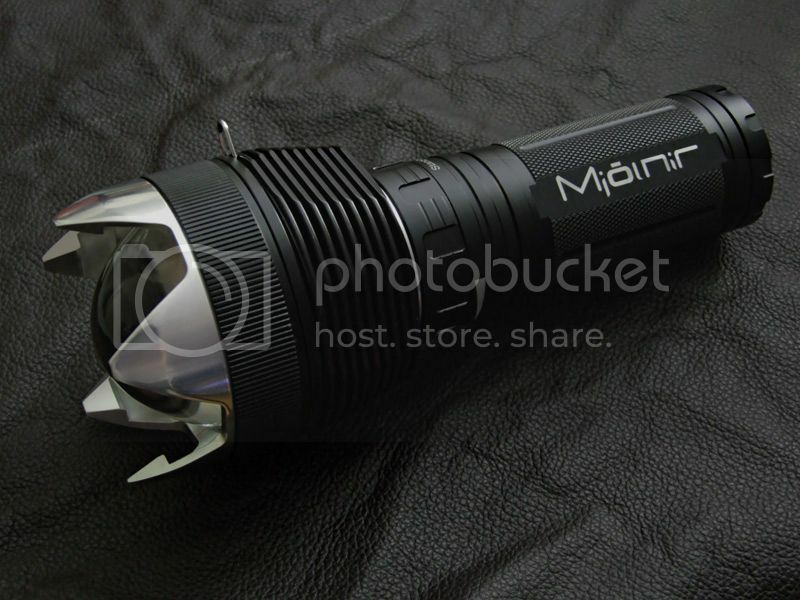 is to be into focusing flashlights, though. suddenly? i had to learn about “zoomies”. how to mod a regular zoomie into one. how to make it better. which lens to use… i devised strategies, both mathematical and practical hand tuning… to construct 2 lens zoomies. i can make a “true zoom” zoomie. i can do those things back into camera lenses too… it all related and intertwined. but, i “See” all this… for lack of no better WORD… “how” i see it… and i know that the f-number relates image brightness, and the same way translates into PROJECTED brightness. i achieved what i set out to try to do, to make a infrared flashlight that put my emitter, same one everyone else was using… to a distance record at that time. i achieved something for myself in my hobby field. i ended up with my very own “build” and i got to name it. visible flashlights? being here? was at first, just a fluke., i was into this, only cause i needed tobe… but, you know, had to get just one LED visible flashlight, LMAO… caught the bug. i can mathematically model a second lens onto any lens, thats imaging or zoomie, and pick my f-number and focal length? practically at will… nd its only possible thru math, and an understanding of the importance of what an f number is, and how to use it, design wise. look… i am starting to “grok” what YOU mean now? your recent post with the 10/10 and 1000/1000 lenses “both being f1.0” got me seeing a little from your point of view… but… if now YOU can try to see things a little from MY point of view? 2) they actually believe, naively and incompletely? that we were supposed to choose out lens, to build our next better zoomie? simply by picking any, and i mean A-N-Y… larger diameter lens. then someone (one of our “lens whores” as we call them there?) whipped up, for a joke… three impromptu zoomies, you know, workbench temporary slap togethers… all the same emitter, with 3 VERY different FL lenses, and showed him what he was implying we “should do”… when he finally SAW that the CAMERA SENSOR needed a certain S-I-Z-E of focused emitter to fill the screen???? he went “oh……” and went very quiet. because of HOW it gets stated? was that “bigger diameter is better! focal length is meaningless!” and we took him for, well… somewhat of a moron. I suppose N-O-W i am seeing that in the flashlight world? ehhh. you just want a really bright light… a super charged emitter… and you place any lens over it. if its a flooder, its a flooder… if its a thrower its thrower… you can get USE out of it, no matter whether its a mule, a mid grade, or a pencil super thrower? but… in night vision? the size of that projected emitter? better MATCH the camera view. you know what i mean? a flooder is useless, a tiny pencil mean is useless. and honestly? theres a zillion peole running around the internet world, going off half cocked with this idea. it would be so bad, but… they CORRECT everyone having any discussion, as if they are sage wizards. and most of them cant build anything. the telescope guys told me about “some moron” who came to their telescope site? telling THEM that for astral photography? they didnt need to “worry” about focal length and f numbers, because… well, they needed to “understand the truth” that only lens diameter “mattered” for pusposes of getting more light thru the telescope system. 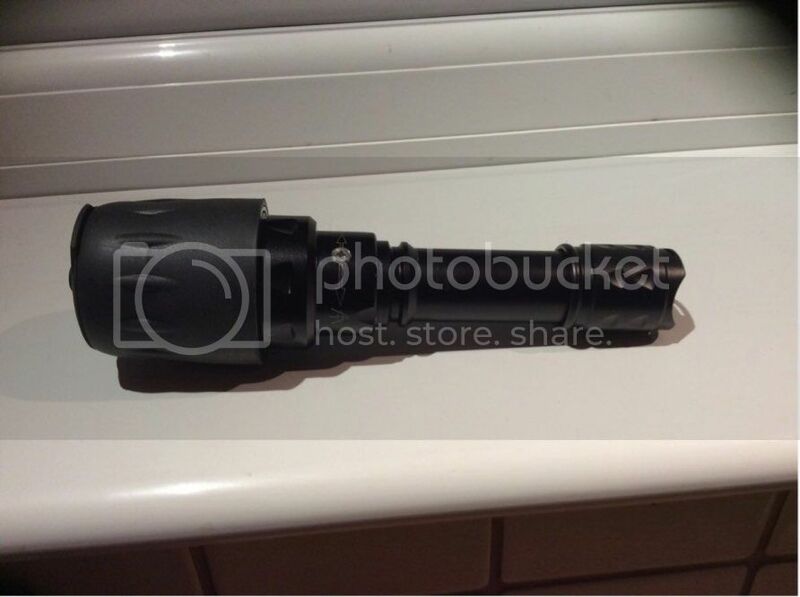 so, when i said i was there “seeing if anyone could give me any designideas for a multiple lens flashlight projecty” they eyed me with GREAT SUSPICION, as you can well imagine, their previous meeting with a “flashlight internet guy” having been so moronic. i had to “prove myself” with a few light math post discussions, before anyone wouldtalk with me about my project. i’m not entirely sure, that you guys realize what impression this is leaving in the minds of people with no backgroundin math, in your hobby, trying to learn how you math guys do what you do? am i making my point, of what i have encountered, better? people with no math to them (and there are many in the world) are learning to repeat the phrase, like a parrot… i think there needs to be SOME more ideas given to them. if you know what i mean? i acted, like i acted??? i thought everyone was acing as if the f-number didnt exist and focal lengths were irrelevant. for a 3x night vision system? i need a specific FL zoomie lens, to fil THAT scope view correctly. my focal length, on my IR zoomie? completely controls the size of my emitter in my field of view, expressed mainly in radians, and half angles, and projective geometry. in my design world? i dont have the luxury of making whatever “beamshape” i feel like making. so yeah, focal length and f numbers are critical. they are design criteria number one two three and four five and six. the night vision guys, and even the telescope guys on that site? we were all math guys, and we were wondering where these morons were coming from, that understood nothing, except to repeat that one phrase, like a parrot. Sunnranger(you know and most of guys here don’t know) is multiple lenses system illuminator(or flashlight) based on yukon night vision device 3×42, F1.4? (there is also bigger version ). Plenty of guys on nvforum were comparing it throw to 67 mm aspheric (X searcher and T67) and it had beaten them in terms of throw but they did not take one important variable – they were not all build under same conditions (same driver, same emitter). But I’ve also decided to build fet driven xp-g2 s4 2b SR pill to convert it into flashlight and I really expected that it will kill at least 50mm aspheric and that it will be close(performance vise) to 67mm one since nothing in classic aspherical flashlight world has clearer die projection. Now something good is probably happening when we use IR light source(or even red emitter source inside such system) since it seems that it is passing that light through system much better than visible white led light. I want to say that this system has great potential Why? 42mm lenses that should throw close to 67mm lenses size which means more throw in smaller head diameter. i was already wanting to make a multiple lens zoomie, and while i was arguing with everyone it was possible… look at my equations… (nobody will look at or cares about equations, by the way) so while i am aguing its possible, and its desireable? at the same time, they were all oohing and aahing over the light he is talking about! i still remember seeing it, and realizing it was a multiple lens zoomie, and one guy said “good god, i was wondering when he would notice it”..
smaller diameter lens, less amps, still keeping up with the joneses ! what great amusement the world gets, out of forcing the software engineer, who SHOULD be just designing prototypes out of cardboard and plastic? what hes good at? i dont understand the amusement at making the software engineer learn metal fabricating skills, and machining, and now foundry work? because the machinists refuse to build his units that work better. the designer? should design. when the prototype works better? then the builders should… well… build it! i dont ask my mechanic to design me a GPS unit, do i? no… its insane. my plumber wouldnt ask me to fix his toilet, would he? no. insane. so, why do i have to go thru all this, for a couple years? 1) i am going to go from scrap aluminum? directly to machining stock in a single step. cost savings. 2) i am the machinist and the fabricator? i dont have to pay a machinist 25 dollars an hour for his time. cost savings. 3) i am the electronics guy, i wire and “mod” everything myself. no outside electronics work. cost savings. 4) i always WAS the designer, doing what everyone else says cant work, showing prototypes that DID work better. all the notebooks of equations? invisible flashlights? machining equipment? now one stops over, i am pouring red hot molten aluminum in my living room? laughing like a madman? The most crisp and sharp die projection ever but in my case it is not equally followed by candela or lux performance when I use classic flashlight emitters because of special NV coating issues I have with yukon lenses… They don’t pass certain color of white emitters so performance is lower than it should be. But with IR emitter and NV equipment is clearly seen potential of such system. Flashlights based on camera lenses or night vision lenses? Achievable! I think I will try again but this time with some cheap China variable lenses without AR coating. And I am also the guy who thinks that aspheric after certain size is undesirable… It is individual but to me sweet spot is 50mm aspheric so if I can have 42mm(or even less) multiple lenses system that will throw like lets say 67 mm lenses than that system is worth a try. That should be equivalent to 67mm IR illuminators single aspheric system. Could you try to form complete sentences or paragraphs please? It’s hard to read the jumble of text…try to keep it short too, thanks. Whoever said that only diameter matters is completely wrong. Both diameter and focal length matter. Both diameter and focal length matter independently. B) there is a lens closer to the LED than in a single lens setup, which increases the divergence hence giving the projected spot a “less sharp” or “larger” size. Ideally, an LED would be a point source of light and it wouldn’t matter how close the optics were to the LED. We would be able to build flashlights with 10mm lenses that would throw just as much as 1000mm lenses. This is Mjolnir from Vinz right? This is not multiple lens system; afaik it uses precoolimator lenses only for main beam enlargement. So it is single lens system with added precoolimator to the emitter. But maybe I am wrong? Sunnranger is triple(or even 4) independent lens system with de-focus to over-focus ability. The precollimator is a tiny lens, so yes it is a multi-lens system. You can see in your image that it is not a clear die projection at all. There is massive red spill around the image, obviously caused by all those stages. A “clear die projection” would not have that massive red corona round it. You can’t avoid little reflection from emitter. Although camera can’t catch all sharpness you can see with your eye it should be clear as day to anyone who have dealt with aspherical flashlights that this is the cleareast die projection ever (far better than lets say B158 which also has very nice beam projection). For me since I also use precoolimators in my aspherical builds; precoolimator is just a way to enlarge main beam projection without lux loss so I never thought about it as dual lens system although technically as U said it really is dual lens system (precoolimator + main lenses). In sunnranger you can also add precoolimator to emitter and then you would have 4-5 lens system. The large circle of light is not from “reflection from the emitter” it is caused by the large amount of optical stages, and refraction between the stages. As I said before, these multi-optic systems give more lumens but also increases the size of the projection. A single optical stage would not cause that circle of spill light, and would create a smaller projection while collecting less lumens. If you look at a high quality single-lens projection of a die you will see that it is just as clear as the sunnranger. Unfortunately I can’t find any specs or product page for the sunnranger? it started life as a regular zoomie. crelant something rings a bell?? someone tried a night vision imaging lens in place of a regular zoomie lens on it? and it kicked @$$ on accident. they had to fabricate it up at that point. it was just on a lark? next thing you know, it was the “best build” for an infrared illuminator for a while. Yeah, punctuation and grammar helps a lot, especially when there’s so much text. i might have to throw a flag on the play. size of the emitter projected? 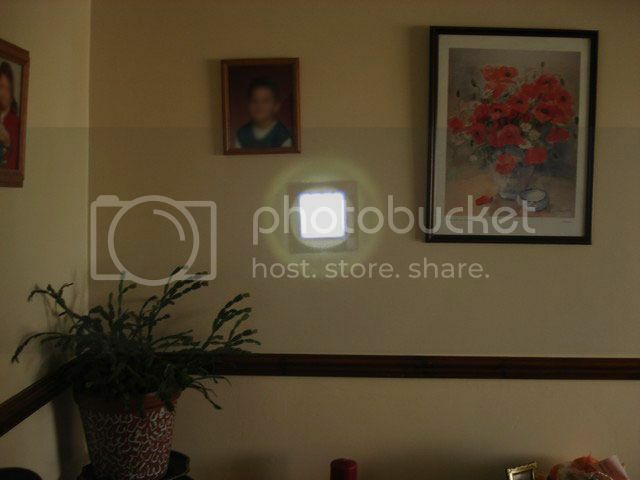 is purely a function of two things… actual emitter size, and the focal length of the lens. it is caused by the large amount of optical stages, and refraction between the stages. When you have multiple optic stages vs single stage, (assuming the final lens is at the same distance) that means the other optical stages are closer to the LED. Since they are closer, the focal length is shorter, which means the delta angle is bigger and results in a larger die projection. Of course if you have the closest lens at the same distance at the single lens then the focal distance is the same and the size would be the same, but then there isn’t really a point to the multi-lens system because it would take up more space without increasing the light captured. The main point of multi-stage optics is to have the system collect more of the light from the LED without increasing the lens diameter to gigantic sizes. It’s easier to move a lens closer to the LED than to make a giant diameter lens in order to capture more degrees of light. oh, no! we have violated Coghlan’s law of absolute throw! we made something better, without increasing diameter! now… mind you, i am impressed you know whats going on with dual lenses. thats a rarity in the flashlight world. It has more lumens, but projects them over a larger area, therefore making a bigger spot with more lumens, and not more throw. With a multi lens setup you use the focal distance of the closest lens, every optical stage after that continues to increase the divergence. You can use any ray tracer to see how adding stages affects the divergence. 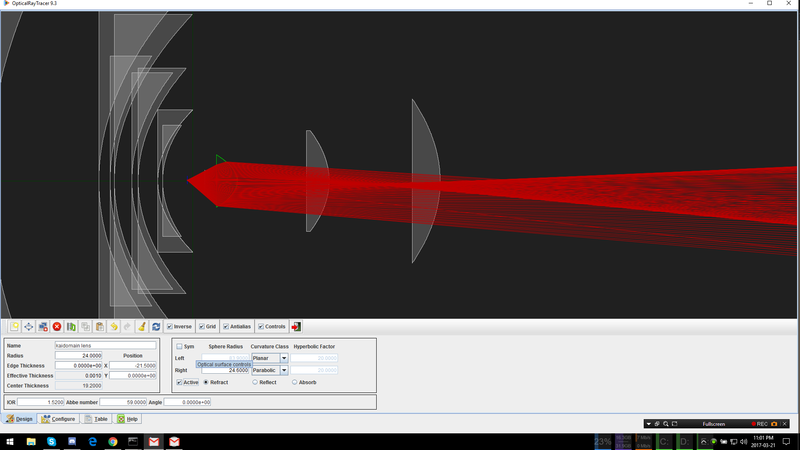 Often with multi-stage optics you need a bunch of custom made precision pieces and there’s a ton of variables, I much prefer working with single stage optics to not have to deal with error/imperfections getting multiplied at each stage, and lower production cost. ho… not so fast… slow down. your right, but, you are making an assumption that doesnt necessarily need be true. 3) what to do? well, we will use two lenses. one of them, the one with shorter focal length? will be closer to the lens, and will collect more light. it will focus it a little,keeping more light now to hit the bigger lens. 4) it is true, that if the same 100mm front lens is kept, the new compound lens? will indeed have less than 100mm combined focal length, and so the emitter projected will be bigger because of the lower focal length of this new compound lens. and yes, it will be brighter because that first lens collected light that would have been otherwise lost, so, efficiency is up and the bigger projected emitter is now brighter. 5) the assumption you are guilty of making? who said we will KEEP the original front 100mm lens? 6) we will replace the single 100mm FL big lens? with 2 lenses, true… but two different lenses! we WANT the projected emitter size of the 100mm FL single lens? so, we obviously WANTED that size of emitter projection, right? 8) we simply pick the correct new front lens? of a focal length that those 2 combine to produce a resultant compound lens… that is 100mm focal length in total! 9) we get a free lunch here…the rear lens collects more light earlier, we have the higher efficiency we like… if it combines with a front lens that the compound lens is 100mm FL overall? we get the same size projected emitter! and its still brighter! i know, how hard would that be? easy… i found the proper equation(s) to predict it, ha ha… and i can prove it. you dont poop your pants over a little algebra, do you? go on… dare me. No, the divergence of the beam depends on the LED distance from the first optic. Once the light hits that optic then the divergence can only get larger, not smaller. You can ignore all the other stages, because the first stage close to the LED will already cause more divergence than a large 100mm lens farther away. In order to simulate a non-point-source of light, the rays are coming from a few mm above y=0, representing light coming from some place that is not the center of the LED. The closer the first optic is to the LED, the more divergence there will be. the green line would represent a point source of light right at the focal point, which results in perfect collimation. the red lines represent the minimum and maximum angles of light coming from the LED. Hopefully you can see why a long focal distance is important. PS- you’re right, you can use math to figure this out, it’s just a bit of trig. i’ll get to the equation in a second… but first? I mean… if i may? we have a problem. we want it solved. that much is obvious… and we even know what we want. just like everyone else? you are spending all your obvious considerable intelligence, abilities, and energy? explaining why it CANT be done. what is the point of that? what do you expect that to get you? problems dont get solved, by looking for more reasons why it cant be done. your second mistake? your point of view is all wrong, from the get go… you wonder IF this can be done… i dont think like that. I simply assume it can be done, then i assume that i’m the man who’s gonna do it. you might find this way of thinking? “arrogant”. I call it “confidence”. the problems you are creating by doing this? are that everyone ELSE keeps hearing a list of reasons why its not supposed to be able to be done. they keep repeating all the reasons why ot cant be done to each other and to more people. now, instead of a bunch of smart people working on the problem in a systematic manner looking for answers? all that is going on is everyone ends up sitting around talking about what cant be done. now, with THAT proper frame of mind? why dont we simply list the things we NEED, then go looking for them. we already know everything we need, you just dont realize it. its just a matter of a little time, a little reading, a little leg work? to find ALL of those things we need… in one simple equation. see? thats yet another problem right there. everyone goes looking for the answer, and if its not already done for you, and handed to you? in a nice equation in “chapter 7” somewhere in a class? they assume there is… no answer. That doesnt necessarily mean there ISNT an answer? that just means no one has found it yet… or? much more likely? the answer is already there, somewhere… its just in an equation, being used for something else, and you just dont SEE that it just needs rearranged into such a manner as to give YOU what YOU want. on wikipedia, the basic optics page? everything is right out in the open, easy basic equations. i laughed when i finally SAW it. The answer had been staring me in the face all along. I must have read it a hundred times, and just didnt realize it. we have 2 lenses. each has a focal length. there is some distance between those two lenses, or, they could be touching. there will be some distance from the first smaller lens back to the emitter. and the whole new compound double lens? will have an overall new focal length. there… theres the keys to the kingdom. hiding RIGHT in plain sight, on the basic math of optics wikipedia page. I realized? there was every one of my variables i was going to have, and whats more important? i knew the value for every one of them! the only thing i didnt know? was what i wanted… namely, what is the resulting new compound lens’s overall focal length, if two lenses are separated by an airgap with a back focal length. simple algebra tells us, that given any equation, if we have all variables known, and one unknown? we simply solve the simple algebra problem, to isolate the unknown variable we want to know on one side by itself. in this case, I was primarily interested in knowing the overall new focal length of the compound lens… so i simply solved the airgap equation for F… because i was unable to FIND it stated like that anywhere else. But, let me back up a hair? originally, i was just writing down all the known variables, as stated in the given equations. all numbers. and the “F” was what i would solve for. i used paper and pencil and my trusty scientific calculator. I just ran the numbers over and over, with different focal lengths and different airgap each time, until it produced a resulting focal length closer and closer to the exact focal length i was looking for, and also had a close enough back focal length it created efficiency. so, i simply started SOLVING the airgap equation, in order to ISOLATE the “F” by itself ??? THIS was the ANSWER! i only had to plug in the numbers and it spit out the answer much quicker, with way less key presses on the calculator, and, way less scribbling with penciul and paper to get each answer. which was of course exactly what i did. after that? all i did was sit there amazed? as i plugged in different focal lengths and airgap values, watching the new overall focal length get spit out… so, when i saw the answer i wanted? i knew which two focal lengths i was looking for to buy, and also how much distance to put between the 2 lenses. i also instantly knew the back focal length, so… i also knew how far away from the emitter to place the first lens. this? allowed me to do a-n-y-t-h-i-n-g i wanted to do! 4) if i know i can only have certain focal lengths of certain lenses available to me on my workbench? i can pick amopng those values, and adjust the airgap until i find the resulting new focal length I am LOOKING for. 5) maybe i want to glue a certain small focal length lens, lets say 5mm off of the emitter? i just pick values and move things around until i SEE a back focal langth thats 5mm… and a overall focal length i WANT. as you can see? i now had the keys to the kingdom. i can make or do anything i want to. and? since i know how to MEASURE the focal length of ANY lens of any style i pick up and find? i dont have to depend on happy chinese specs, i KNOW the focal length of ANY lens i put my hands on if i want to know. there is practically nothing i cant do with this, and quickly. when i start playing and building on the bench with visible emitters? i simply blow cigarette smoke into the light path in a dark room, and i can SEE on a piece of white paper the exact diameter lens i need to put there to capture ALL the light of the system without losing any. AND i dont have to use a bigger lens than i NEED. And??? if i know i “need” two 100mm lenses to get what i want? i can also use two lenses pout together like this to create ONE of them, use THAT for “lens 1” and start playing with making two other lenses be the OTHER “lens 2”… thereby easily and fairly quickly creating a 3 or 4 lens system. which puts the lenses in a row, with more regular space, capturing and shaping the cone of light along the path, adjusting to not “lose” any as i go. you see? if i try to do something “actually impossible”? the equation tells you! you get an undefined divide by zero answer. or the back lens is touching the emitter. or, you run out of space or get an error before theres enough airgap to yield the focal length you are looking for? i simply bump up one of the focal lengths and bring it back into shape. since i already know how to predict the SIZE of a known emiters projection ata known distance (differant easy trig equation, childs play)? if you want an xml2 to be for instance 100 feet across at 300 yards? it will tell you wen you solve the chief soh cah toa, what focal length you NEED as the overall focal length to paint that size emitter at that distance. if it calls for a 200mm diameter lens to capture all the light? poop to thatr! we just start adding lenses… click clik clik… until we have our system solved. surplus shed? has so many different lenses of different diameters and focal lengths? its ridiculous, they are all cheap… my simple program makes it easy to play what iof for a few minutes, until you get the criteria you want. a simple “jig” on a workbench and some cigarette smoke and a piece of white paper? allows me to do the prpototype build. once i fab up the prototyoe out of pvc or cardboard tubes? i can cast a piece of stock and machine up to make it out of aluminum. you keep telling me made up reasons why it “cant” be done? i already DO IT on a regular basic before! i have SEEN units that do stuff like this, its not impossible. and i have MADE the stuff before, it works. if you wanted? i suppose i could list several emitters, and let them ALL spit answers out, or, let the person adjust the distances to see different results. its just a couple basic equations, and a short vis basic programi made before, i could make it again in short order. well, hate to break it to you? i dont… i kind of hold them in front of myself and just JUMP into them all at once. and yeah? i do this same thing with imaging lenses too, for night vision. i buy a lens with longer FL than i want? and drop the FL by adding a lens behind it… which lowers the F number to wjerever i want it to be. since the F number controls how “powerful” the night vision unit will be? it should be obvious my units are, uhm… “better”. and i can do things the other night vision builders cant do. or that they think is impossible or priced like unobtainium. dont you see? i am an ENGINEER, i used to make “mathematical models” for a living when i was younger. i have 2 university degrees in mathematics and computer science. thats not just a phrase to me… thats what i “do”.